Children need to explore. We give them that opportunity. At Kiddie Academy,® we believe caring and learning go hand in hand. That is why our teachers strive to deliver the most comprehensive learning and supportive environment possible. Children will learn throughout the day, including playtime, because the opportunity to learn is always present. 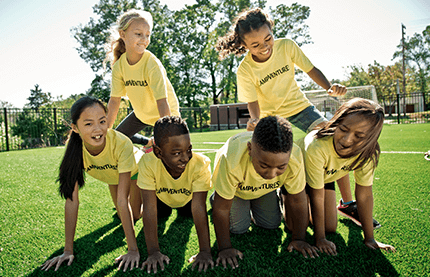 Life Essentials® is Kiddie Academy’s proprietary developmentally appropriate curriculum and supporting programs, methods, activities and techniques help better prepare children for life. 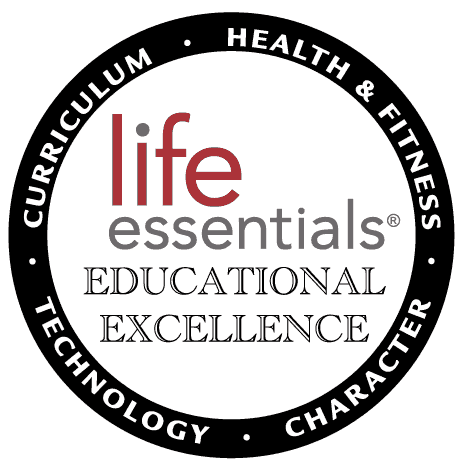 Life Essentials gives your child a happier, healthier, more well-rounded foundation for the future. In other words, what children learn at Kiddie Academy will help to prepare them for school and for life. 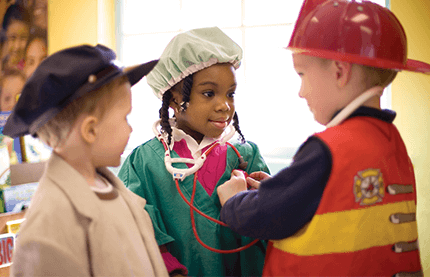 At Kiddie Academy, children learn from the time they enter our academy until they leave. Throughout the day, children interact with their peers and teachers in small and large groups. 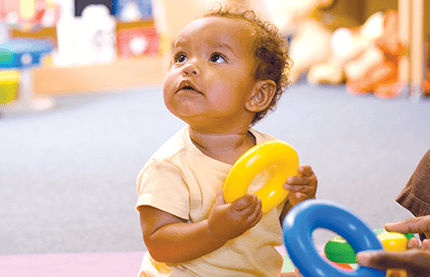 They have the opportunity to learn and to discover in our developmentally appropriate learning centers, as well as outside on our age-appropriate playgrounds. 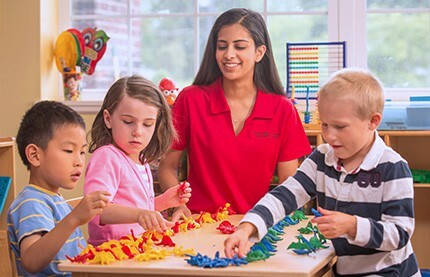 Kiddie Academy understands that 2 year olds want to be independent. They want to explore, touch and mimic their peers and teachers. We took all of this into consideration when developing the Exploring My World curriculum. 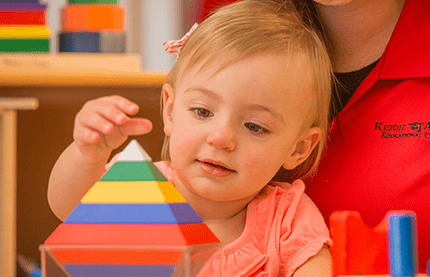 The Exploring My World preschool day care curriculum focuses on your two-year-old child's primary areas of development. Language Arts and Literacy: When they are two years old, children are constantly practicing and increasing their vocabularies. 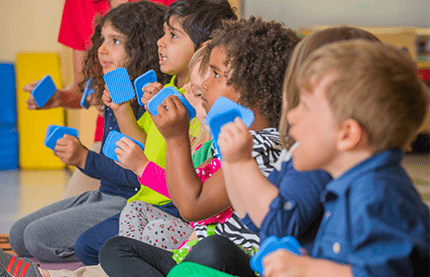 We create ample opportunities for them to sing, chant and participate in finger plays. Children are encouraged to read in the Library center and retell the stories using pictures or felt boards. Mathematics: Teachers engage children in counting and identifying numerals. 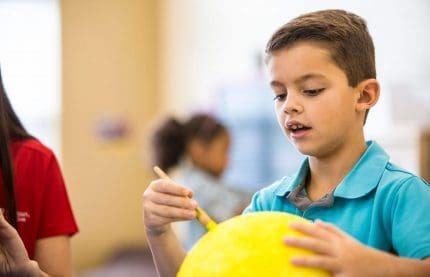 They also encourage activities that will help children build one-on-one correspondence, recognize shapes and measure various items with standard (ruler, tape measure and thermometer) and non-standard (paper clips and foot prints) measuring devices. Science: Children are natural explorers and there is so much to learn! At Kiddie Academy, children are given the opportunity to investigate items that float and sink in the water table and search for buried treasures in the sand table. Kiddie Academy teachers help children recognize the parts of the human body. They discuss the difference between people, animals and plants. Children also learn about the weather, seasons and how things work. 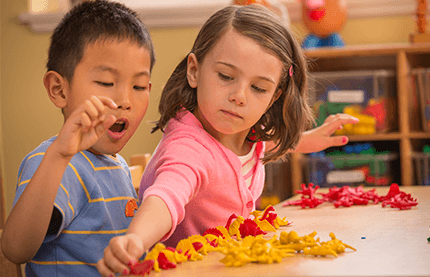 Social and Emotional Development: Kiddie Academy helps children build their independence. This is a vital time for children to interact and play alongside their peers and to begin learning how to solve problems effectively. Your child will love pretending and playing with other children in our dramatic play center. Gross and Fine Motor Development: Children’s independence continues to develop as they practice their motor skills. Their fine motor skills are enhanced by learning to feed themselves with forks and spoons during our family style meals. They also practice writing, using scissors and completing puzzles. The learning continues when their gross motor skills are heightened by playing on our age-appropriate playgrounds. They are able to run and climb outside, jump and walk backwards, and throw and kick a ball. Children also love to dance and have fun with the many musical activities incorporated into Kiddie Academy’s daily routines. Character Education: At Kiddie Academy we believe it is important to introduce children to a wide variety of character traits. Each month we focus on a positive value, such as honesty, generosity or patience, to help children better understand the society we live in and to help them develop into caring adults. A two-year-old experiences STEM through natural interactions with materials in the child’s classroom and outdoor environments. 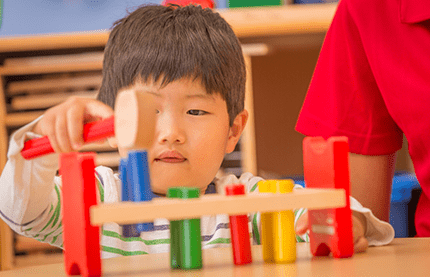 Through building with blocks, the children are encouraged to build bridges and ramps, incorporating early engineering and math skills. 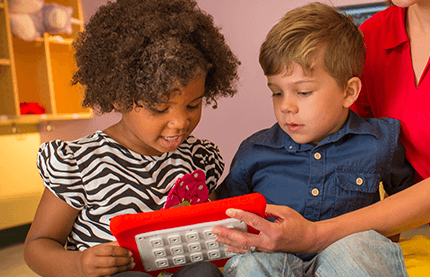 Technology is utilized in the two-year-old curriculum through the use of simple tools, such as magnifying glasses and microscopes. Outdoor learning enhances STEM education by inviting the children to participate in discovering and experimenting with the natural environment.